The Riviera Nayarit Convention and Visitors Bureau (CVB) chose Newlink as their communications and public relations agency of record for Mexico in 2019, continuing the work they began last year in the North and South American markets. The Riviera Nayarit Convention and Visitors Bureau (CVB) continues to position itself within the domestic market in 2019 with Newlink, its communications and public relations agency of record. The agency’s work with the CVB began in 2018 in the North and South American markets. Beginning in January of this year, the firm based in Miami with offices in Latin America and Europe will be in charge of the design and execution of an extensive communications program for the destination with activity in different regions of Mexico. “It’s a privilege for Newlink to be the Riviera Nayarit’s communications partner for the domestic market, helping the destination to connect in a meaningful way with its diverse audiences and reach its maximum commercial potential,” said Teresa Villareal, senior vice president for the agency. She added that Newlink will oversee the promotion and positioning of the Riviera Nayarit as an eclectic beachside destination catering to the sophisticated traveler seeking unique and exclusive vacation experiences driven by a luxury hotel offer and the area’s eco-diversity. Beyond simply focusing their efforts on the luxury travel segment the agency will also undertake public relations strategies targeted towards increasing demand among members of the tourism industry and end consumers. As part of their efforts they will highlight the destination’s newest luxury developments opening in the coming year from various globally-recognized brands. 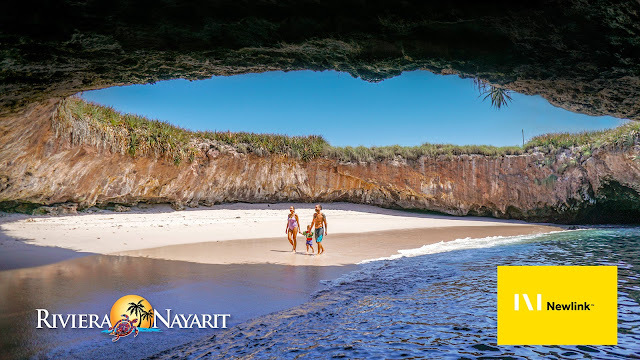 Marc Murphy, managing director of the Riviera Nayarit Convention and Visitors Bureau (CVB) and the Bahía de Banderas Hotel and Motel Association (AHMBB), reiterated that Newlink is the ideal agency to represent the Riviera Nayarit. “With their global presence, a focus based on results-driven public relations, and unparalleled experience in the tourism sector, the agency is the ideal communications partner for our destination,” he stated. Newlink is an award-winning international consulting firm headquartered in Miami, Florida, with company-owned offices in the Dominican Republic, Perú, México, Argentina, and Spain. The tourism segment is one of the fastest growing areas in the company. The team is dedicated to igniting transformation by collaborating with clients and creating a transformation that allows them to connect better with their audience and the travel sector including destinations, hotels, airlines, digital travel agencies, and more. Newlink’s portfolio includes brands such as LATAM Airlines, Expedia Group, Hotel Xcaret México, and Solmar Hotels & Resorts, among others.